On Sept. 14, 2009, one of Drum Corps International's most endearing Hall of Famers received a posthumous honor of singular distinction. Col. Truman W. Crawford was known to fans for his work with a multitude of drum corps. In 1965, every major title-holding corps in the United States and Canada was either instructed by Col. Crawford or performed his musical arrangements. 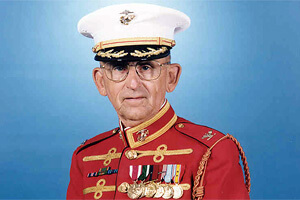 During the first few decades of Drum Corps International, Col. Crawford was best known for his 25-year-long tenure as Commanding Officer/Director of the United States Marine Drum and Bugle Corps. Under his leadership, the corps became a top-notch musical ensemble that annually delighted fans at the DCI World Championships and a host of other events throughout the year. And now, in the heart of Washington, D.C.'s Marine Barracks, there is a building that bears the name of Colonel Truman W. Crawford Hall. The hall serves as the rehearsal facility and home of "The Commandant's Own," the United States Marine Drum and Bugle Corps. outside of Truman W. Crawford Hall. 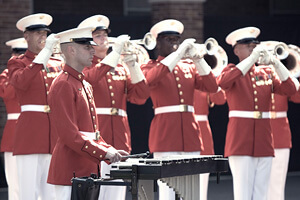 A number of important dignitaries attended the dedication, which included a performance by the Marine Drum and Bugle Corps. 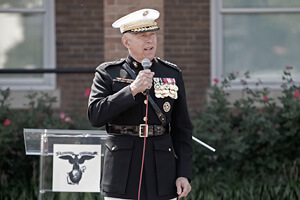 General James T. Conway, 34th Commandant of the Marine Corps, presented the remarks just prior to the ribbon cutting. Earlier, Col. Crawford's son Robert had the following to say about his father's love of music: "It wasn't work to him but a passion that he loved to do. At night his body would rest but his mind would be working on that next piece of music or an idea of a drill to go with a musical piece. He fed on the emotions and the pride of the corps. The United States Marine Drum and Bugle Corps consumed him. He loved his job working toward excellence. But if you'd ask him, it was a labor of love." The Marine Barracks, Washington, D.C. is one of the oldest landmarks in the nation's capital city. The current building occupied by the Marine Drum and Bugle Corps was erected in the early 1900s and has had a diverse number of uses from rifle range to ceremonial meeting space, to the longtime rehearsal facility of the "President's Own" United States Marine Band. 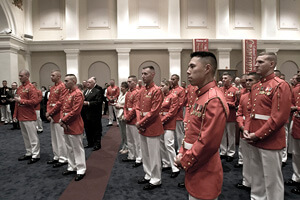 As home to the Marine Band, the hall was dedicated to legendary "March King" John Phillips Sousa. The building received a renovation in 2005 after the Marine Band relocated, which allowed the Drum and Bugle Corps to expand from little more than 4,000 square feet of operating and rehearsal space to some 20,000. Several years in the making and more than a century after its construction, the building has been rededicated in honor of Col. Crawford. The 'Commandant's Own' performs at the dedication. "This [dedication] displays how important music is to the Marine Corps, and more specifically, the art form known as 'drum and bugle corps,' said current Marine Drum and Bugle Corps Director CWO-4 Brian Dix about the honor bestowed upon the man he succeeded. "This building is a testament to his success." On the drum corps field, Crawford served as brass arranger for the Chicago Royal-Airs Drum and Bugle Corps from 1962-1968. Royal-Airs alum Chris Ferrara reflects on the things that made Col. Crawford such a force in his students' lives as well as their music. "When the two busloads of Royal-Airs members pulled up to a restaurant, Col. Crawford would go into the kitchen to help the staff prepare and cook the food," said Ferrara. Royal-Airs alums are quick to remember the Colonel's trademark red handkerchief, which he would pull out of his back pocket and throw into the air when a section made a major mistake in rehearsal. "Everyone would wait quietly to find out what instruction would be delivered on how to fix the problem," said Ferrara. Event attendees gather inside Truman W. Crawford Hall. In 2002, as a tribute to Col. Crawford, the Royal-Airs formed a reunion corps to perform at the DCI World Championships, giving thousands of new fans a glimpse into the era prior to the formation of Drum Corps International. Col. Crawford was an integral part of this project and relished the opportunity to once again instruct a corps bearing the Royal-Airs name. Col. Crawford passed away in 2003 from ALS, more commonly known as Lou Gehrig's Disease. In the new Truman W. Crawford Hall hangs an oil portrait of the Colonel, in full dress uniform, arms outstretched as if directing the Marine Drum and Bugle Corps one last time. At the dedication, Robert Crawford concluded with these words from his father as a lasting legacy of the man who never lost his love for making music nor his love of the drum corps activity: "Life is too short to wake up with regrets. So love the people who treat you right, forget about the ones who don't. Believe everything happens for a reason ... If you get a second chance, grab it with both hands. If it changes your life, let it. Embrace it. Nobody said life would be easy, they just promised it would be worth it." Photos courtesy Cpl. Jacob H. Harrer, U.S. Marine Corps.